I know exactly what you are thinking right now. You want your own set of trophies. Right? I didn’t realize how much I needed these babies in my life until I saw them all standing next to each other. The other day I went to the Dollar Store and my eyes saw these beauties. Well, they were not this “beautiful” on the shelf (they were actually kinda ugly) but my brain knew exactly what they WERE going to look like. There are so many days I wish my brain would chill out for about 19 minutes and then there are days when I am saying, “thank you brain, thank you“. I wonder if my brain knows that I am proud of it? 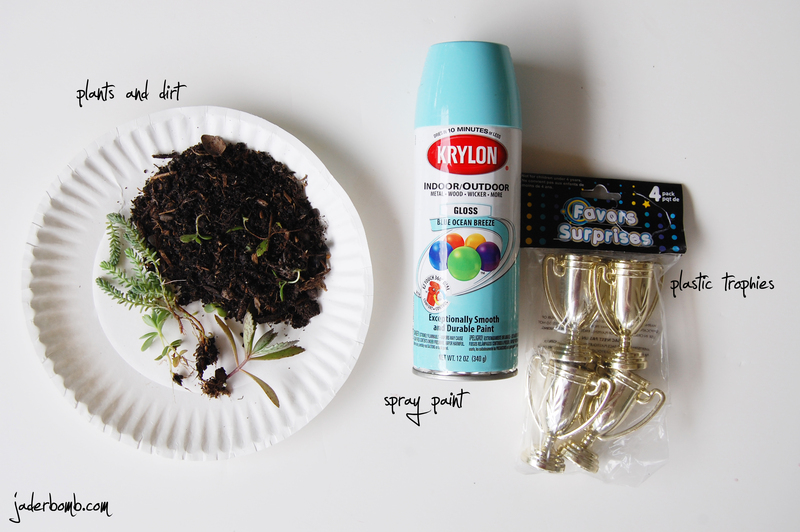 I flipped over an old plastic pot that I had and sprayed these suckers. 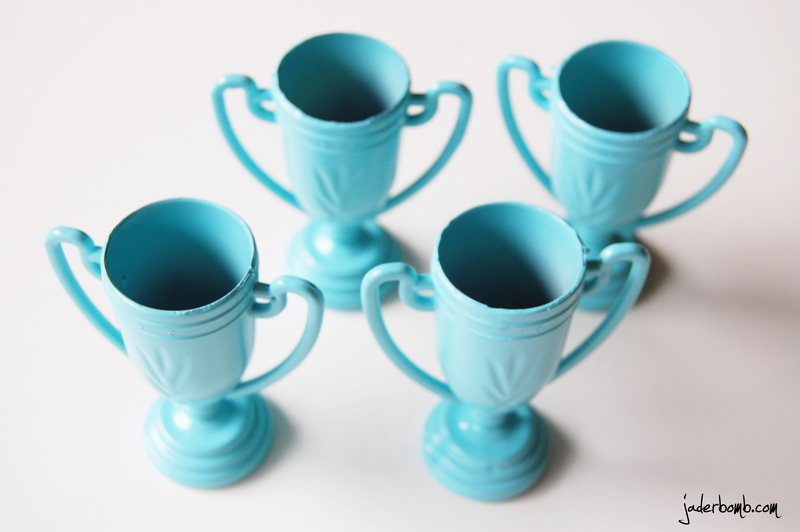 It’s easy using something like a pot because I was able to turn it around and spray other parts of the trophies. 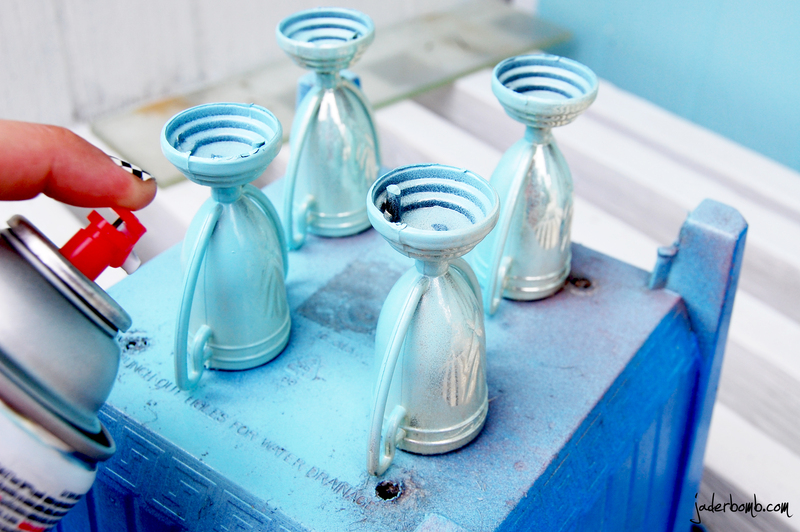 This is what they will look like once you spray them and they are FULLY coated. make sure when you flip them back to the right side that you spray from the top. You want the inside to look coated as much as possible. Yay, we are almost done! You get it right? They are just amazing. Did you ever get a trophy? What was it for? Oh my goodness…these are darling! Clever & cute! We will post about it on DollarStoreCrafts next week! Pingback: 6 Weekend DIY Ideas! | CraftyChica.com | Official site of award-winnning artist and novelist, Kathy Cano-Murillo. Great idea! 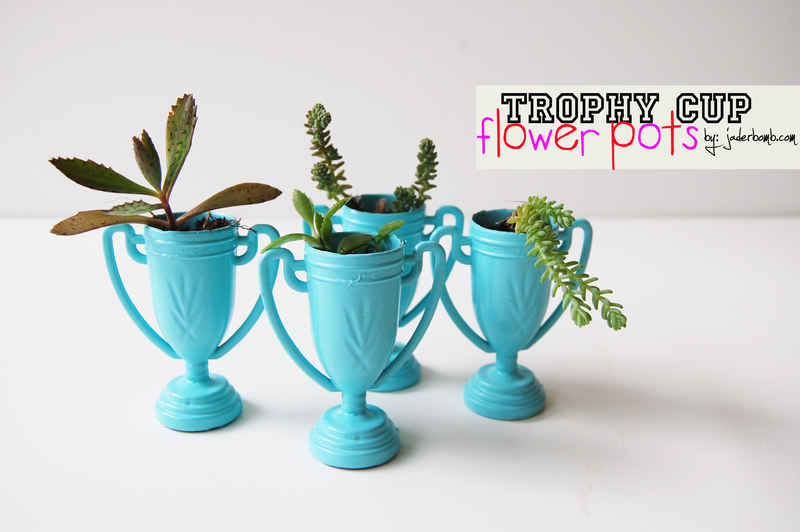 A good way to repurpose trophies from thrift shops if you wanted them to house larger plants. Great Blog,really amazing post that you shared,thank you so much for sharing your blog. I recommend spray painting them. The water color will not stick to the plastic. Hope this helps! Great Blog thanks to share it,i love your blog so much. 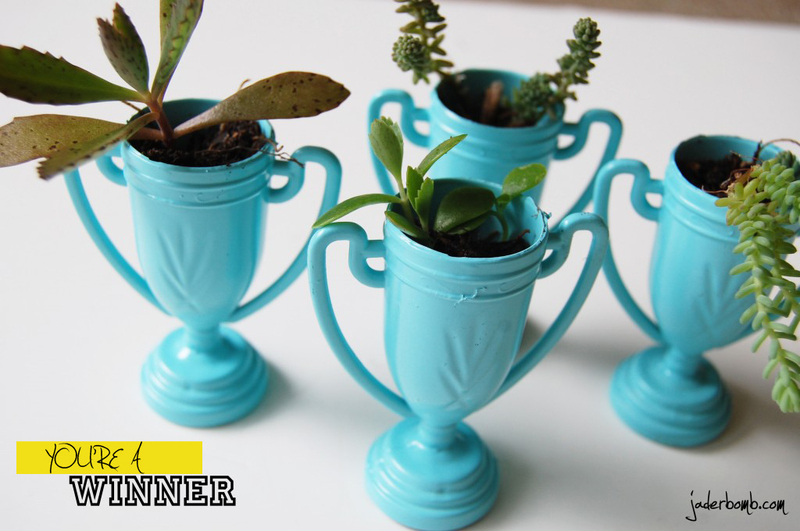 i love planting,now i can do the indoor planting with trophy..thanks to share your blog..
That is awesome! Happy Planting! Wow! These are a fantastic idea! Thanks for the detailed pictures! Its so beautiful trophy cup pot thanks for share awesome post. Really i like these, Thanks for share wonderful photos its amazing article so nice. Thanks! I think they are super cute as well! They make nice little gifts or could be used as table decor for a sit down dinner! Oh my god what a ceativity is it Thi is too good .